YardEdge talks to dancer Stefanie Thomas, one of the dancers in the recently concluded Jamaica Dance Umbrella. 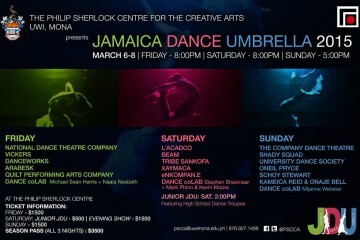 The festival was an exciting display of the diverse dance talent that we have in Jamaica. Congratulations to all the organizers and hope to see it again next year! YardEdge: Why are you an artist/dancer and when did you first become one? Stefanie: Being an artist provides an excellent outlet for the expression. It allows engagement of imagination and of constructive analysis on a very different platform. As an artist one is able to stretch the boundaries of what exists, bringing forth new creations, and sharing with an audience a part of yourself and your vision. Art is within us all and I have been blessed with various platforms for expression. I can’t think of a ‘moment’ when I became an artist. I started doing ballet at about age 4 with Norma Spence at the Ballet Center. Stefanie: I would describe my work as Eclectic and Evolving. I am taking my exploration of choreography one moment at a time, constantly looking for inspiration whether it is through music, individuals, or events that challenge my concepts of space, time, or energy. YardEdge: What type of dance do you do? Stefanie: I explore various forms of dancing including modern contemporary, lyrical and Afro-Caribbean. YardEdge: Which company/group do you dance with, if any? YardEdge: What other interests do you have outside of dance? Stefanie: Any form of artistic expression whether poetry, painting or music. I adore traveling and exploring new cultures. YardEdge: What inspires you to keep motivated when things get tough? Stefanie: I am motivated by prayer and faith, knowing that the tough times will only make me stronger. YardEdge: Who are some dance companies and or dancers that you admire? Stefanie: I am inspired by the Ailey Company, Complexions and the depth of history that surrounds our National Dance Theater Company. I find inspiration in dancers who push the boundaries of dance and constantly explore their relationship with dance. YardEdge: What’s the best and worst parts of being an dancer? Stefanie: The best part of being a dancer is having an outlet for expression. I could do without the sore knees and ankles! YardEdge: How would you describe the state of the dance world in Jamaica? Stefanie: The dance world in Jamaica is definitely in a process of evolution. Dance is increasingly becoming a mainstay in our culture, not only through the growth of various dance groups that display traditional and modern contemporary forms, but, also through the growth of dancehall as a genre. YardEdge: If you could be doing anything, what would that be? Stefanie: I would be traveling the world and gaining insight and inspiration from interaction with new cultures and people. Stefanie: I am developing my skill through practice and through trying different avenues of expression. YardEdge: Do you dance professionally? i.e. Get paid to dance? Do you want to? Stefanie: I don’t get paid to dance. Stefanie: When I’m not thinking of what comes next, I am thinking of how to best communicate through movement the message of the particular piece.